A dog was struck by a truck on the George Washington Bridge on September 10 at about 3:20 p.m. The dog, named Ronin, a 6 month old male puppy who lived with his owners on Fort Washington Avenue in Manhattan reportedly wriggled out of his collar during a walk and fled, making his way to an upper level eastbound lane of the bridge (NY bound). When Port Authority Police officers on patrol arrived at the scene, Ronin was bleeding heavily from his injured right front paw and leg. 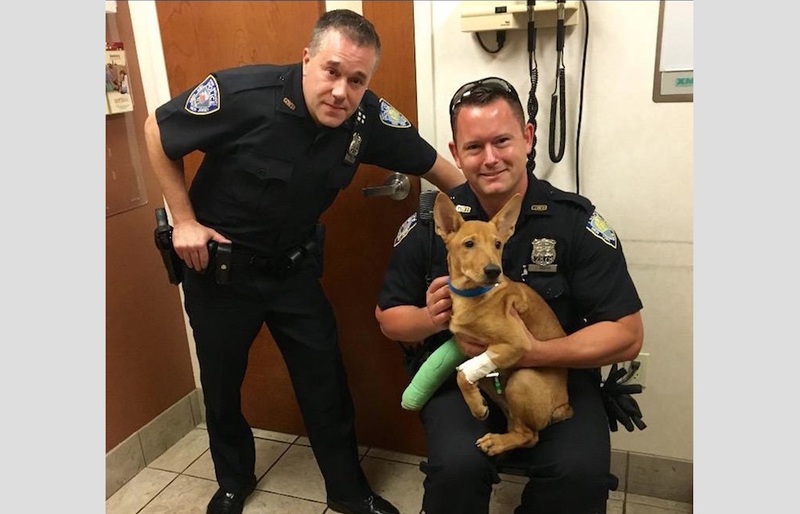 Recognizing the severity of the dog’s injury, Port Authority Police Officers Fred Corrubia and Jonathan Harder sped Ronin to Oradell Animal Hospital in Paramus where Ronin received emergency treatment. At about 3 p.m. on Saturday, September 10, the pet’s owner contacted PA police at the George Washington Bridge about her lost dog. Officer Corrubia contacted the animal hospital and the anxious pet owner was reunited with her dog. Today, Ronin’s owner paid the final visit to the vet for Ronin’s follow up care for his injury. He is recovering.